no one has to die tomorroW. 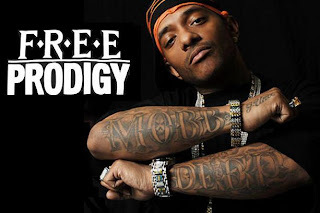 : Prodigy of Mobb Deep, "I was fast alseep but now I'm wide awake"
Prodigy of Mobb Deep, "I was fast alseep but now I'm wide awake"
Prodigy of Mobb Deep is sitting in prison for the next three and a half years for exercising his Second Amendment. In October 2006 he was pulled over in NYC for making a u-turn to secure a parking space. For some reason his SUV was searched, and they found an unlicensed .22 caliber pistol. Unfortunately he is not set to be released until 2011, but he dropped some heavy truths before he went behind the wire. Prodigy has also been a victim of Internet censorship, you tube removed his videos after an earlier release of this song. February 2008 Prodigy endorsed Ron Paul for president on NY's Hot 97(radio station), he is clearly a patriot. Support his efforts to awaken the masses.